After paid work, I had 15 minutes to spare, and an itching* to get started with something new. 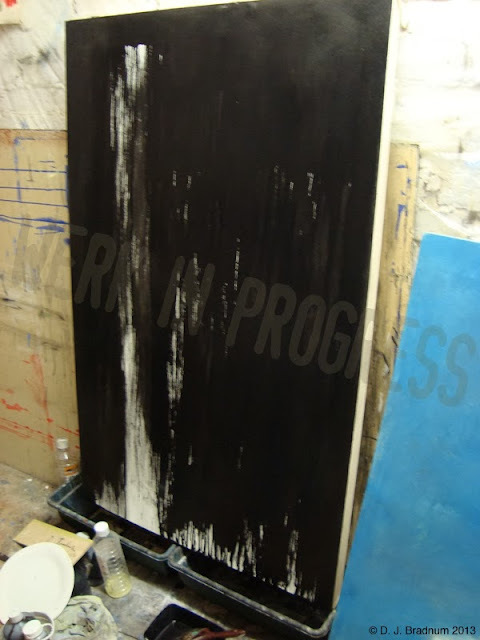 I lugged a canvas I had made some time ago out to the studio, and set about desecrating its pure white surface with a decorators brush and black ink. And now I don't need to worry about 'blank canvas syndrome' when I return next time. *the itching is related to the fact that I have won a painting prize and have been offered a solo exhibition in London. This has galvanised me to get back to the easel (I have barely painted since the commission I finished at Christmas). I feel a strange mixture of chomping at the bit, whilst simultaneously feeling a slight crises in confidence. But two things are clear: I must seize this opportunity; and I must find a studio space closer to home, to fit better with family life.